School tours and youth camps - discover exciting Poland with us! 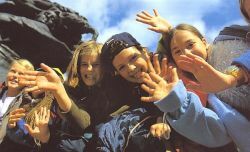 Almatur - Opole is the Polish leading tour operator for children and youth trips in Poland since 1956. We boost many satisfied groups every year. We specialize in the organization of varied programs for visiting Poland. The camps have a recreational character. Recreational and sports events are held by qualified instructors. Our leisure program is a combination of cultural and physical activities designed to have fun and to provide an opportunity to discover another place and culture. Every program may be base for a shorter or longer school trips, combined with some local sightseeing tours, according to our idea of Custom-made tours.